Cambridge, U.K./NY: Cambridge University Press, 2012. hard cover in dust jacket., no flaws or wear. clean, no markings, tight binding. appears unused. ; xvi-468pp., 21 b/w figures, 2 tables, 13 maps. detailed, well researched military history.. First Edition. Hard Cover. Fine/Fine. 8vo - over 7¾" - 9¾" tall. Keywords: The Russian Front. ; Operation Barbarossa. ; German Invasion of USSR. ; The Russo-German War. ; World War Two. 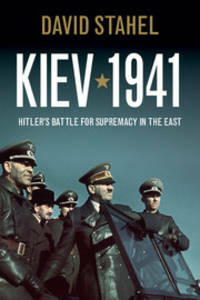 ; Kiev in World War Two.